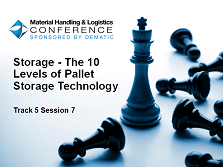 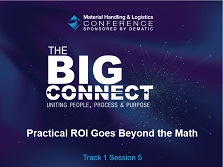 The presentations on this page are from various supply chain and logistics industry trade show events. 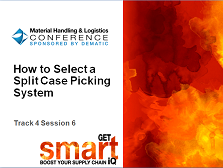 Please check back with us frequently and be sure to send us some feedback if there is a topic you would like us to write about; or if you wish to offer some insight of your own. 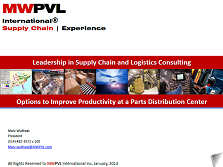 We will be sure to get back to you. 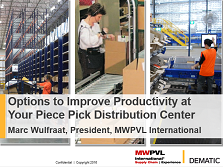 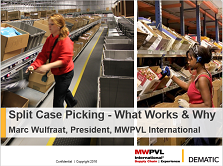 February 18, 2016: Webcast produced by Supply Chain Management Review publication. 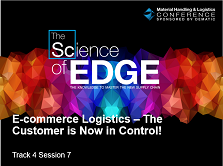 E-Commerce Logistics - The Customer is Now in Control! 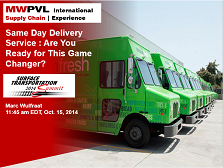 Same Day Delivery: Are You Ready for This Game-Changer? 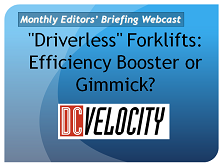 ”Driverless” Forklifts: Efficiency Booster or Gimmick? 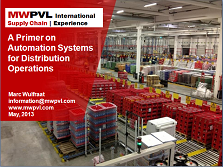 An Overview of Solutions and Applications for Robotic Industrial Vehicles. 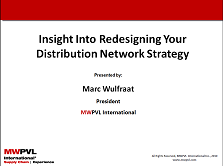 You can watch a recording of this videocast if you Click Here. 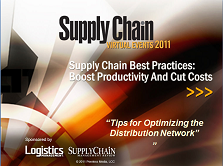 October 26, 2011 Supply Chain Virtual Event produced by Logistics Management and Supply Chain Management Review publications. 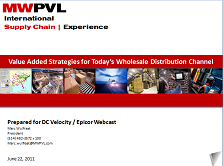 To replay this presentation as a recorded webcast on the DC Velocity DCV TV channel please Click Here. 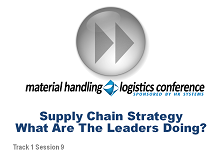 Supply Chain Strategy: What Are the Leaders Doing?